iBaby Monitor M6 WiFi Wireless Digital Baby Video Camera features a high resolution wireless camera and ability to record your baby, send alerts and share video with multiple users. This digital monitor will help you stay on top of things as a parent. With iBaby Monitor M6, you can see your baby in high definition from anywhere you are. The video feed will be streamed directly to your mobile device (phone/tablet) while connected to Wi-Fi, 3G, 4G, or LTE. No need to go to the baby’s room to adjust the view from your monitor. You can easily turn your monitor 360° or tilt it up to 110° from your mobile device by smoothly swiping your finger on the app. When you need to check on your baby at night, you can conveniently do it from your bed thanks to the monitor’s clear night vision. The LED lights provide enough light while not disturbing the baby. Babies love music! Choose your favorites from the lullaby and bedtime story library to play for your little one, or record your own voice to be played later. Say ‘cheese’! iBaby Monitor M6 automatically takes a series of photos or a short video clip when it senses motion or sound. Now you won’t miss what is happening in the nursery. Turn on Sleep Mode to temporarily restrict access of all users to the video feed. Also choose how much access to give to your baby monitor’s viewers. You’re in full control! Is Ibaby M6 compatible with İphone6 and Samsung Galaxy Note ..? When is it going to be available, ship date for anyone that pre-orders it? Also, the app screen shots look great. Does it have the function to send you alerts (push alerts) to your mobile device when the camera detects movement or sound? Thank you for contacting iBaby! All pre-order units have been shipped. Please let us know your order # (if any) and we will follow up on your purchase. Yes the monitor sends sound and motion push alerts to your smart device. You can purchase iBaby M6 from Apple stores and online in Asia Pacific.The duration of the video is 15 seconds. Thank you! Can this be purchased in Bangkok or India? Please let me know. The iBaby Monitor M6 is currently not available in India. You can purchase from Apple online in China, Singapore, New Zealand, Australia, US, Hong Kong. is this compatible with android systems? Does this camera have the option for continuous monitoring? We have a camera now that will eventually time out in less than 10 min if the app is left on. We like to be able to leave on at night while we sleep in case we don’t here the alerts. Yes iBaby Monitor M6 will continuously monitor for 24/7/365. Also, it offers sound and motion alerts in case of any sudden movements or loud sounds. where I can buy this camera in Spain ? The iBaby Monitor M6 is currently not available in Spain. You can purchase from Apple online in China, Singapore, New Zealand, Australia, US, Hong Kong. Can this be wall mounted? Or does it require a flat surface? At this point we do not have the wall mount. However, it is in our plan to add it as an extra accessory to be purchased later. There is a glitch in the iBaby M6 app. I have an iPhone 6 with most recent iOS 8.1.2 (up to date.) Manually taken pictures and video cannot be saved or shared. I can view them under “Media”, but when I click the “Share” icon the only two options are “Delete” and “Cancel” buttons that pop up from the bottom of the screen. Hi – I currently have a M3 and would like to buy an additional ibaby monitor. Is the new M6 compatible to be used on the same app as the M3? Can I simply “add camera” so I can have both monitors running on the same app? Thanks! Thank you for contacting iBaby. The M6 monitor uses a separate app because it uses a different technology. The monitor can only work on Wi-Fi. We apologize for the delay. Unfortunately, M6 is still not available in UK. We are working on this but still no ETA. We can ship through our US office but the shipping cost need to be paid by the customer. Does this only come as one camera? How can I add another one to the system? Can this camera be hung from the ceiling looking down on the kids room? You can purchase one M6 monitor and install our free iOS and Android app to use the monitor. Currently we do not have a wall mount kit but we are working on it. Hi I currently have an M3. I want to add another camera. Can i add this M6 and use my M3 simultaneously in the play room and the other one in the sleeping room? 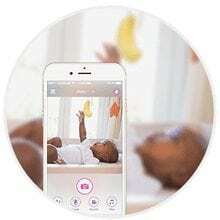 iBaby Monitor M6 works with a separate app than M3. Looking to buy my first baby monitor for my first baby and very much aware the M6 is the one to have but… you do not sell it in the UK! why is this? are you releasing it in the UK any time soon? I know you have commented on a few other countries to buy it from US etc. But if I buy one through you via the US will it come with a 3 pin plug to use in the UK? and what warranties will there be for it should I need to return it, heaven forbid its faulty? Will be gutted if I have to go with another product as spent a long time look for the right one. Hi, I’m considering buying an M6 in Hong Kong and bring it back to the UK to use. But my uk andriod tablet (4.4.2) and uk android phone (5.0) apparently cannot download the app with the error message. I want to make sure it works on my andriod devices before buying it. Pls advise. Thx. Please contact us through support@ibabylabs.com and we will be able to assist you in downloading and installing the app. Hi there, dose this camera have invisible LED lights in complete darkness? hi i was wondering if i buy this is there a website my husband can log into when hes out of town to watch the baby because all my husband has is his laptop? When will the iBaby M6 wall mount be available to purchase? hi, I just wondering if I bought it from Apple store(Canada), Do I still have the surprise gift? You can only get the surprise gift through our website! Hello. I am from România and i’m intersted about Ibaby monitor M6. Which is the Closer shop to buy this product ? Thank you for your interest in iBaby monitors! Does Ibaby allows to have multiple monitors connected on the same iphone? How would it work? Do I have to buy several monitors and install them all? Thank you for your question and thank you for choosing iBaby! To answer your questions, you can connect several monitors to the same app. In the app, choose ‘Add camera’ function to add multiple monitors. You only need to create one account for that but you do need to buy several monitors. You can log in into your account from several devices, such as smartphones and tablets. Hello. I bought iBaby M6 camera and the image quality was good. But the next day everything changed – the camera can not focus and the picture is blurred. How to restore the focus? Sorry to hear about that. If you’re still having the issue, please get in touch with the customer service who will help to handle this. You can email them at support@ibabylabs.com or call +1 650 396 2436. The customer support team is in Mon-Fri, 9AM-5PM PST. Thank you. Thank you for your interest in iBaby. Yes, we can ship to Kuwait but you will have to cover the shipping costs. For a shipping price and to arrange such order, please get in touch with the customer support team. They can be reached over the phone +1 650 396 2436 or over email at support@ibabylabs.com. The team is in the office Monday through Friday, 9AM – 5PM PST. Thank you! I love this product, is the best of babysitter cam! But, iBaby Labs, i need one application of Windows, OS X, because, i work in my home office and take the cellphone, iPad on, is not good! Thank you for choosing iBaby and sending us your comment. Indeed, currently it is only iBaby Monitor M3 that can be viewed online from your computer. But having access to the app from a computer is definitely something we are considering for our future products. Stay tuned! If you have a network set up with the apple router without wifi hooked up to it, will this monitor still work? All my apple devices can communicate with one another on my network, but can not access wifi. Will my apple devices work with the M6 monitor? Thank you for your interest in iBaby. iBaby Monitor M6 is a Wi-Fi based monitor, which means you do need Wi-Fi for the monitor to function. The only monitor that can be set up in the way you describe is our iBaby Monitor M3, which is IP-based. If you have any more questions, feel free to contact our Customer Service: over the phone at +1 650 396 2436 or over email at support@ibabylabs.com. The team is in the office Monday through Friday, 9AM – 5PM PST. Thank you! How does this camera stay charged 24/7/365? Especially if you have it hanging from your ceiling.. Does it work to your phones charge? Are you supposed to get the adaptor to keep it charged? Thank you for choosing iBaby. The camera does not have a battery. It needs to be plugged in with the power adaptor. Hi guys im ordering my first M6. Do I need to purchase the extra adaptor/charger? Or is it included in the M6 package? One power adaptor is included in the package. Note that it has the Type A (American) plug – if you are located out of the US, you might need to purchase an electric plug convertor into your country’s plug. About how much cellular data does the monitor use? Hi Kendra, it would depend on how much you use the app, what resolution video you’re streaming, etc. For the short amount of time this monitor actually worked (less than 6 weeks) it was great. Set up was easy and I was able to take it to my mom’s as well as my aunt’s house and quickly get it working. This is the reason I at least gave it 2 stars. However, one night it worked and the next night it didn’t. The light continually flashes red and green and app will not progress past the preparation phase. I followed ALL of the trouble shooting instructions on line and completely uninstalled the camera and app and started from scratch and was unable to get it working. Their very own website states that if your light continuously flashes red and green to please contact customer care because there is currently no fix for that problem. So I emailed them followed by calling them. The person I got on the phone was trying to be helpful but was insistent that I go through all the trouble shooting steps with her that I assured her I had already done. So after going through all the steps and it still isn’t working, of course the problem is with my router! Yeah right. My router mysteriously re set itself. As well as the one at my moms AND the one at my aunts house because I attempted to use it again in both of those places as well. They have finally started the process for me to mail mine back to them in exchange for a new one. I have to pay for shipping to return their faulty product as well as provide a credit card for them to mail out a new one “in case they don’t receive the old one back” or so they say. This thing was 180$ and for the price I expected better than 6 weeks of functionality as well as being out even more money to ship back their faulty product. CAN NOT recommend. Yikes! We apologize for your experience. Our customer support do try their best as there are so many routers and so many different setups that it can be tough to determine where the fault could lie. It looks like you guys determined it was a bad unit – but how did the replacement fare? Is everything alright now? Does the app allow for a split screen if you have 2 cameras going and you’d like to view both? Can the audio be running constantly, for example, if I would like to monitor more than one room at night? Will I be able to go out and still be able to check in on my baby at home through the app and get live feed? Hi Alexis, thank you for your question. You can definitely access the live video feed even if you’re out from the house. Hi Nicola, thank you for your interest in our award-winning monitors! You can definitely purchase a monitor through our website. Thank you and have a great day! What is the difference between the M6 and the M6T? Also can I connect two phones to the same monitor ? Hello Monica, Thank you for your interest in our iBaby Monitor. The main difference between the M6T and the M6 is that the M6T can detect temperature and humidity. You can definitely set up multiple monitors at the same time. All you need to do is toggle between each monitor to see each individual video feed. If you have any other questions, please don’t hesitate to contact our customer support team at support@ibabylabs.com. Thank you and have a great day.